An exhibition currently taking place in Beirut, titled ‘The Shape of a City’, is satisfying for the British artist Nathaniel Rackowe on many levels, not least because it brings his relationship with the Lebanese capital full circle. To explain further, Rackowe takes us back to 2009, when he visited Beirut for the first time as part of a residency programme, organised by the Delfina Foundation, located in London. The work that resulted from this two-month visit was later shown at the Delfina Foundation and would prove to be a gateway to new opportunities for Rackowe, including a chance encounter in London with Annie Vartivarian, whose plans to launch the Letitia Art Gallery in Beirut, together with Mohamad Al Hamoud, were fast taking shape. Rackowe explained that with the conversation turning to the large public sculptures that were on display outside the Gherkin in London, both he and Vartivarian agreed that Beirut would lend itself to something similar. “We felt that an outdoor installation would help to reach the members of the public that are traditionally reluctant to enter gallery space,” he said. Over a year later, ‘The Shape of a City’ exhibition is now in full swing, a rich and diverse display of mixed-media works, including three large-scale and six smaller, floor-based sculptures, and a series of 21 framed works on paper. 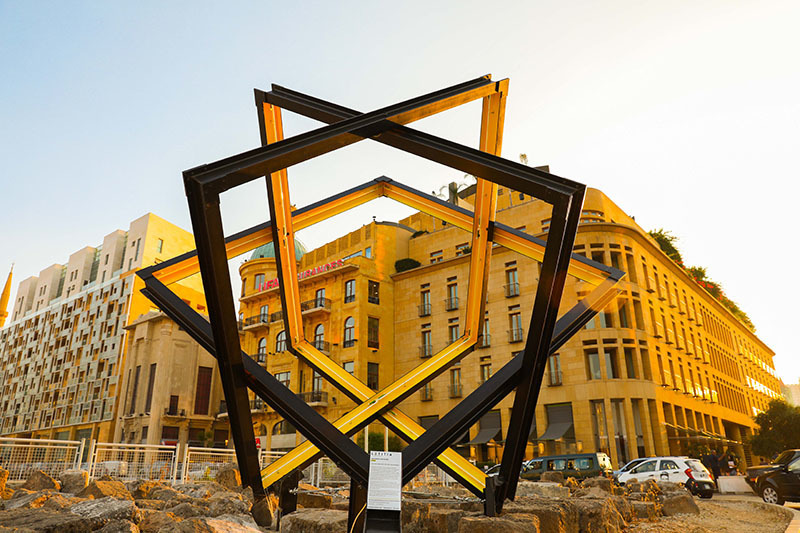 As hoped, two of the large sculptures are on show in public spaces - one in front of Le Gray Hotel and the other in Khan Antoun Bey Square, downtown Beirut - where they are already contributing to the exhibition in their own way by changing the urban landscape. The gallery show will run until August 25, while the two outdoor sculptures will remain at their respective locations until January 2019. Cities and their changing nature, including both the destructive and constructive components, have long been a source of fascination and inspiration for Rackowe, who has undertaken similar projects in several hubs, including Paris and Bangkok. “I’m interested in what makes a city tick,” he explained. As part of his research for the Beirut show, he immersed himself in the city “moving around the space”, as he puts it, absorbing what he could “with an outsider’s eye”, while also drawing, thinking, writing and taking photos as part of his preparations. And then there was the pivotal process of choosing the materials for the pieces. 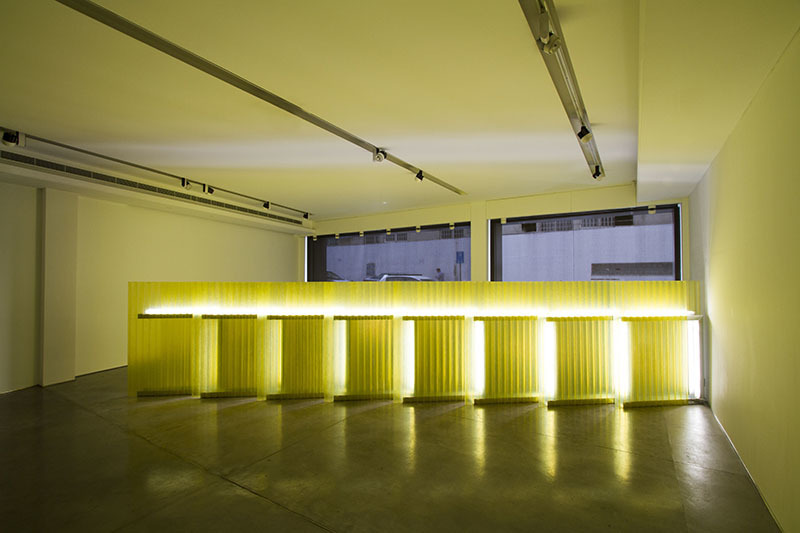 The large installation at the Letitia Gallery combines various construction materials, including mass-produced, glass-reinforced plastic sheeting and folded galvanised steel, while white fluorescent lights illuminate the structure, giving it echoes of a scaled-down building site. The floor-based sculptural works also have an industrial feel to them, taking the form of artificially lit cement blocks, while the works on paper are titled ‘Petrol Station Canopy Series’. Rackowe explains that while roaming around Beirut, he was struck by the levels of ingenious improvisation he observed when it came to the construction of the city’s petrol station canopies. Rackowe said the feedback from the show had been extremely positive so far.